Bhala aur kya chahiye logon ko? Well, how about coherence and originality? So first we meet one Vishy in Mumbai who beats up people in gravity-defying style and does do-numberi-ka-kaam, as his neighbour Aunty says. Then a bubbly girl called Khushi (Sonakshi Sinha) sees him in a clothing store trial room where he is (get this!) trying out underwear, and later when he emerges from a toilet after doing susu. I don’t know which clothing store in Mumbai allows people to try out chaddis, but be warned if you go shopping in that city. So anyway, Khushi has seen Vishy’s thingie, which somehow turns her fortunes. Which makes her want to see his thingie again before an Amreeka-based boy comes ladki dekhne ke liye, because she thinks Vishy’s thingie is a good-luck charm. But Amreeka-based boy doesn’t stand a chance because he is not played by a major Bollywood star. Plus, Vishy is played by Ajay Devgn so how can she fall in love with anyone else, you silly-question-asking people. Khushi soon falls for Vishy because when she falls unconscious in his house, he doesn’t change her kapda but maintains her laaj by getting neighbour Aunty to do the deed. Besides, he does nice things for poor people, being bad guy with heart of gold and all that, you know. You know? Enter: second Ajay Devgn. Whoa! What a twist! He is first Ajay Devgn’s humshakal. Why? Bichhda hua judwaa bhai, you ask? No no, he is humshakal because he is humshakal. You didn’t ask questions when it happened in Don in 1978 so why discriminate now, stupids? Bangkok-based AJ works for ek aankh waala gangster. He also has a girlfriend-turned-wife (Yami Gautam). Enter: ek aankh waala gangster’s bad sister Marina (Manasvi Mamgai) in thigh-revealing outfits and cigarette between lips. Now phillum launches into Fatal Attraction-type obsessive love saga complete with daayin laugh in background and girl kissing boy as though her lips are “a vacuum cleaner” (not my words, his). Vishy and AJ meet. Lots of people get beaten up. Arms and necks are twisted. Ajay as Vishy clowns around while bashing up local goondas. Ajay as AJ takes off his shirt and poses about artistically to bash up international gangstas. Beech-beech mein, lots of people dance to loud songs in loud costumes on gaudy sets featuring every single colour of the rainbow. Uskey beech mein Vishy’s sidekick (Kunaal Roy Kapur) appears – to be funny – and disappears. 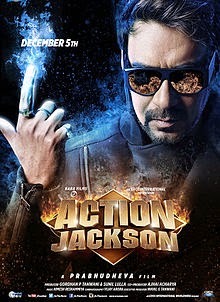 The unwitting star of Action Jackson – in a good way and a bad way – is debutant Manasvi Mamgai, former Miss India. When she’s trying to look ominous, she’s a hoot. Not her fault, the film is just THAT silly. In fact, she’s featured in a scene that teeters on a precipice between offensive and laughable: AJ has come to save Marina from being raped by a hooligan and while he’s fighting them, shirtless of course, she’s ogling him through a curtain of her hair! Ugh! But don’t write her off. In that scene in which she raises a leg shoulder-high to kick a man out of a high-rise building’s window, she displays a skill that ought to find a place in A-class action flicks. And in the song You’re my gangster baby, notice how uninhibited she is, how completely not body-conscious, so lost in the moment that she makes Ajay look like a prop. Of course the impact of all that is vastly diluted by the fact that AJ casually kicks Marina aside at one point while she lies on the floor. Yes, rips off his own shirt, fires a gun and kicks her. I kid not. At the end of this mind-numbingly unentertaining film, I consoled myself with the closing credits in which Prabhudheva (kindly note the spelling) appears in his dance-wiz avatar playing choreographer to the lead cast. He’s so vastly superior to Ajay in that department, that you can’t help but appreciate Ajay for sportingly demonstrating his shortcomings to the world. What he was thinking when he accepted this film though is a mystery that may never be solved!